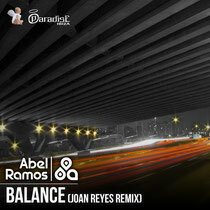 Abel Ramos teams up with DJ/producer Joan Reyes for a remix of ‘Balance’, released on Paradise Records, a DJ Center Music Group label. Born in February 1973 and raised in Madrid, Abel started DJing at a local club, aged just 15, playing anything that was synth-driven from Human League to Nitzer Ebb or acid house. It didn’t take long for Abel to establish himself as one of Spain’s most talented DJs, catching the ears of thousands along the way and winning awards such as Best National DJ in Deejay Magazine, gaining top gigs for the likes of Sensation, Rock In Rio and Global Gathering. Now Abel teams up with Joan Reyes who, in just one year, had a Beatport #1 that became the second best selling track of the year, and scored two major electronic music awards, including Best Breakthrough Producer of the Year, the only Spanish artist nominated on Beatport Music Awards. The track is currently available on Beatport, with a worldwide release on June 10. Have a listen below.